High-throughput centrifuge that maximizes your bench space and exceeds performance. 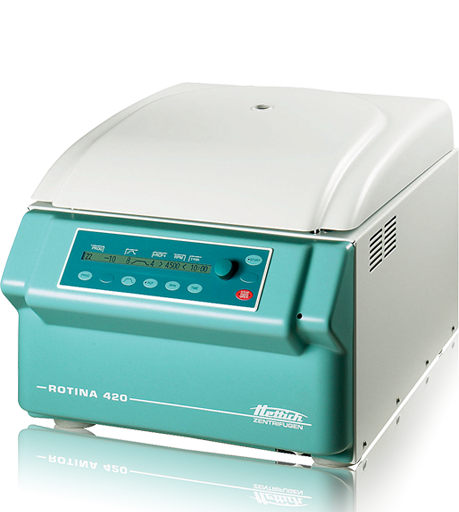 The Hettich ROTINA 420 is a high-performance benchtop centrifuge for large sample volumes, yet not overly large in size. 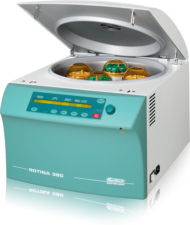 With a maximum capacity of 4 x 600 ml, (104) blood collection tubes, (52) 15 mL conical tubes or (16) plates, the ROTINA 420 and ROTINA 420R refrigerated (-20 to +40 °C) centrifuges are ideal for applications in clinical chemistry, in biotechnology and in life science research facilities. Hettich’s Versa-Rotor savves time and effort. Spin a variety of media types and many configurations all with one rotor. Swing-out 2-place rotor for up to 12 microtiter plates with bio-containment. Max. RCF of 3,926. Shown below are the most common application packages for the ROTINA 420 centrifuge. Custom packages are available, please inquire for details. The ROTINA 420 Blood Tube Package 4 BC comes complete with everything you need to perform your application. This includes the ROTINA 420 or ROTINA 420 R centrifuge, swing-out rotor, buckets and adapters for 13 x 75/100 mm and 16 x 75/100 mm and bio-containment lids. Many a-la-carte options are also available, contact us for more details. The ROTINA 420 Blood Tube Package 2 BC comes complete with everything you need to perform your application. This includes the ROTINA 420 or ROTINA 420 R centrifuge, swing-out rotor, buckets and adapters for 13 x 75/100 mm and 16 x 75/100 mm and bio-containment lids. Many a-la-carte options are also available, contact us for more details. The ROTINA 420 Cell Culture Package 4 BC comes complete with everything you need to perform your application. This includes the ROTINA 420 or ROTINA 420 R centrifuge, swing-out rotor, buckets and adapters for 15 mL and 50 mL tubes and bio-containment lids. Many a-la-carte options are also available, contact us for more details. The ROTINA 420 Cell Culture Package 2 BC comes complete with everything you need to perform your application. This includes the ROTINA 420 or ROTINA 420 R centrifuge, swing-out rotor, buckets and adapters for 15 mL and 50 mL tubes and bio-containment lids. Many a-la-carte options are also available, contact us for more details. The ROTINA 420 Plate Package comes complete with everything you need to perform your application. This includes the ROTINA 420 or ROTINA 420 R centrifuge, swing-out rotor, and buckets. Many a-la-carte options are also available, contact us for more details. The ROTINA 420 Bottle Package BC comes complete with everything you need to perform your application. This includes the ROTINA 420 centrifuge, swing-out rotor, buckets and adapters and bio-containment lids. Many a-la-carte options are also available, contact us for more details. High-capacity and variety for the most demanding workflows. Featuring our Versa-Rotor for tubes, bottles and plates eliminating the need to change, purchase additional rotors. 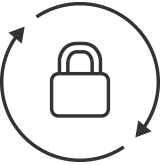 View all resources for the ROTINA 420 | R in the resource library.